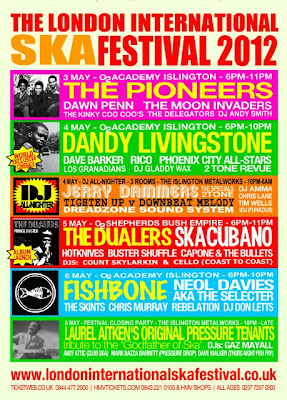 The London International Ska Festival returns this year, from Thursday 3rd May until Sunday 6th May, featuring another array of Ska and Reggae legends. Headline acts include Dandy Livingstone, Owen Gray (replacing Dawn Penn), George Dekker & Jackie Robinson from The Pioneers, Dave Barker and Freddie Notes. Other bands of note include London Dossier favourites Ska Cubano and The Dualers. DJs include Gladdy Wax, The Tighten Up Crew and Steve Rice (Downbeat Melody). The venues for the main concerts are the Islington O2 Academy and the Islington Assembly Hall. On Friday, Saturday and Sunday there will also be after-parties down the road at Islington Metalworks, 7 Torrens Street, EC1V 1NQ until late. I myself will be DJing at the after-party on Saturday night and can offer half-price admission to Metalworks for all London Dossier readers. If interested, you must let me know in advance.